I’ve been dropping hints about this for months now… finally I can show you the first prototype Cioch Liner Jacket. Neil and Helen at Cioch may decide to call it something different if they ever decide to put it into production but at the moment “Liner Jacket” seems the most appropriate name. And since I “designed” it, that is what I’ll call it. Well, I say I designed it, but it’s so simple that’s probably over-stating it. Helen and Neil also came up with some great tweaks particularly to the hood. As you may have noticed, we both really enjoyed using the Glamaigs during the winter. I was not looking forward to going back to my eVent shell for the summer. Impressively breathable though it is. So I started wondering about how I could reduce the weight of the Paramo fabric based system even more. 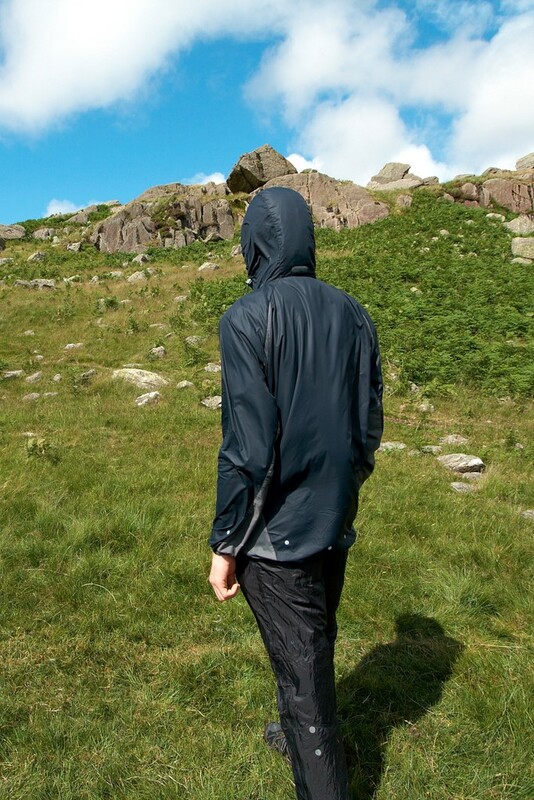 A Paramo fabric based jacket is made of two fundamental parts; the outer and the pump-liner. The outer is there partly as a windproof but critically, it is there to slow raindrops down. If they hit the pump-liner at terminal velocity, they explode through it. Making you wet. But it struck me that I carry something just like that anyway during the summer; my Montane Litespeed jacket. Importantly, the Litespeed has a hood. So surely, I thought, all you need is a pump liner on its own that you can wear under the Litespeed when it rains? Helen has come up with a good face panel that I’d not thought of. There are poppers instead of a zip and short sleeves to save weight. I’m reserving final judgement on the short sleeves. They do save weight and I have only had one, brief couple of minutes when I had cold arms. And although wearing a micro-fleece under it meant the arms of the fleece got wet they were still warm and dried quickly. This is for summer use after all. The only thing I’d change is the Velcro Omni Tape (they now seem to have re-branded it Anti Snag) volume adjuster at the back of the hood (Cioch don’t use Omni Tape – I supplied that to them). It should be vertical along the centre line of the head, allowing as much or as little of it to be overlapped as required to change the volume of the hood, but we got our wires a little crossed. But the hood fits so well I’m not convinced that it even needs a volume adjuster. Price on application (to Cioch not me) but Neil reckons a maximum of £80. Weight is excellent at 252gms, bear in mind I’m not small. The event Rab Drilium that it replaces is 353gms. But for a full waterproof you also need the Litespeed: 186gms. Making a total of 438gms for the Liner + Litespeed. But of course I’d be carrying the Litespeed anyway. It’s too versatile during the summer not to. So that’s a total of 539gms for the Drilium + Litespeed. Meaning an overall weight saving using the Liner Jacket of 101gms. But the weight isn’t the main point for me. In fact I may even have considered carrying this if it worked out heavier. It being lighter is just a big bonus. The main point is the supreme breathability. I’ve tried it in very warm conditions in late June during wet weather mixed with bright, hot sunny intervals and I found that it had my hoped-for massive comfort range. I would have been throwing my eVent jacket on and off regularly but with the liner jacket I hardly had to change at all. So it might be warmer in a sense, it’s two layers, but they’re thin layers and they are as breathable as a T-shirt. Which means overall, even in summer conditions, you remain comfy. Is it the perfect summer rain jacket? Well not quite, but as as I’ve said before; there’s no such thing as perfect kit. The poppers are a slight fiddle. The fact that you have two jackets to throw on in a downpour is a slight extra faff. Though of course you’re less likely to be changing clothes so much as I’ve just mentioned. Probably the worst point is that the hood has no peak. I’ve not had time to think about it in much depth. Maybe it could be given a stiffened brim but that may interfere with the brim of the Litespeed. So far though I’ve had no problem since during the summer I walk with a Tilley hat (hey if Ryan Jordan and Chris Townsend love theirs who am I to argue?). As you can see from the picture, it forms its own brim nicely. Again it’s not perfect, the rain does tend to run around and onto your cheeks. But for a very, very wet weekend in the Peaks recently it did me fine. Does it keep me dry? Do I really need to say? Of course it does. Bone dry. To give you an idea of how much I like it and already trust it, it will be coming to Iceland this week, a very wet place indeed, instead of the eVent jacket. Very interesting indeed, I like this idea. All you need is a bespoke Pertex outer, call it the Yeti and take it to the marketplace. Very interesting – can it be made in black? And I would prefer the long sleeves too. Any idea how it works with the windproof underneath it instead? I guess it wouldn’t work as well since some of the rain would still get driven through the liner but it would get stopped of course. It would just be nice being able to put in on over the windproof when the weather got worse. 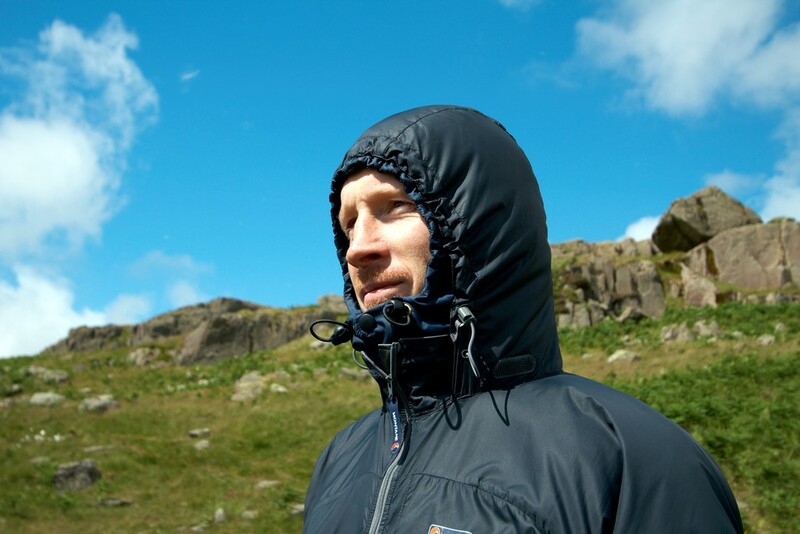 I’d almost be tempted to drop the hood, keep the collar and run on a Paramo cap + the lightspeeds hood when need be. The colour will presumably be fixed by whatever colour Paramo make the Parameta lining in. It’s pure luck that it’s a niceish blue really! Very interesting. Does it really keep out the rain? Does some not get in around the hood or through the litespeed zip and gaps between the poppers? Fascinating stuff. I’m sorely tempted to give Cioch a call. 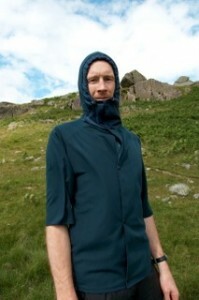 I think I’d go for long sleeves, more poppers & swap the hood for a highish & use my paramo cap. One of things that appeals (apart from the weight) is that I can ‘upgrade’ different windproofs for different activities, beefy ones for climbing, light ones for backpacking & garish yellow ones for the bike. Excellent ! Alan – I think as Martin says that the colour isn’t something that’s likely to change since it’s really meant to be just a liner in a jacket that’s faced in another colour. Your choice of windproof would determine the colour that your “appeared” as on the hill. And yes, I’ve decided that although it’s not a fatal flaw, I prefer long sleeves so I’m having that changed. Martin – I agree that putting the windproof underneath would not work as well. It probably would work fairly well most of the time as the liner should pump the water that gets through to the windproof back out. But in a downpour I feel sure it wouldn’t keep up and you’d get wet. Geraint – Does it keep out the rain? Well yes… and in its present form… no! The pump liner does keep out the rain. The hood section made of Beachcomber material (not pump liner) soaked up the rain and I got ingression in a spreading patch from my cheeks. It managed to reach mid way down my torso in fact. I just returned from a thoroughly, thoroughly wet trip to Iceland (of which much more later) and stayed completely dry only when I folded the hood back in to the outer hood to keep it out of the way. But with the hood set like that, yes; totally bone dry. Which is more than can be said of even my eVent clad friends who managed to overwhelm their jackets with sweat when working hard in the rain. They had damp clothes and condensation inside their jackets. I was dry. I think perhaps that the hood doesn’t give such a great seal even then when used with the Litespeed but I didn’t get the usual patch of wet on my chest even then. I think the pumping action worked well for me there. In the mean time if anyone is thinking of getting one of these – hold fire until we get the hood fixed! Balhameagle – I found the that number of poppers sufficed nicely. I’d be wary of adding more as they are a fiddle to do up. But as I said above – long sleeves are the way for me too. Wet fleece or wet fleece+Thermawrap isn’t fun. Plus the water runs into your gloves even more than ever. I should also mention that I quickly discarded the Tilley hat. In prolonged heavy precipitation (we had all kinds) it acted as a gutter to soak two lines down my front. Far worse than the hood on it’s own managed (as I mentioned above). A Paramo cap is a nice idea. Especially if worn on the outside. The Tilley wets out eventually but if I’d had another day to try it I’d have given that a go on the outside instead. 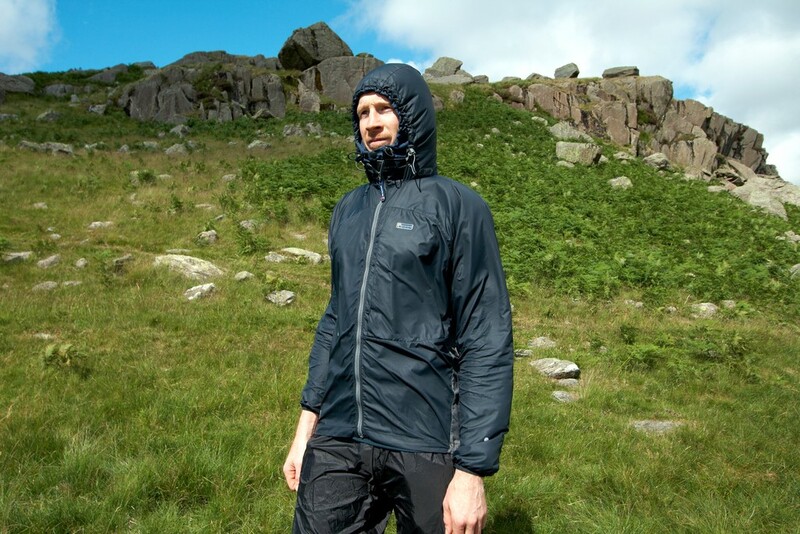 I’d not thought of being able to change windproofs – that’s a bonus. I’m guessing that you’ve probably seen the interesting news on PTC’s blog by now. If/when Cioch get there hands on some of that I reckon I’d be torn between a really minimalist Glamaig (and not carrying a windshirt) and a liner jacket…. While you were away I ordered a liner jacket from Cioch. Mine will have long sleeves and a detachable hood. I though that most of the time i would wear my Tilley without any hood or over the litespeed hood if it was really bad. I didn’t know that the hood was made of a different material than the rest of the jacket. makes be glad I went for detachable. What is the beachcomber fabric by the way? Most of the hood is pump liner. It’s just the face part that was made in a windproof fabric (which I’m pretty sure is Beachcomber – the fabric used as the shell on a Glamaig). Neil has said they’ll rethink that part so your hood shouldn’t suffer the same fate! I’m expecting it around the end of the month. Will keep you posted how it performs. When will we here about your Iceland trip? And I love the top and I love Paramo and am looking forward to lighter versions of their gear, whoever they are made by. I’m dying to write up the Iceland trip! And yes – Paramo. I’m a convert. Flipping amazing! Ah, Paramo must have been reading this. Next year they’ve got a two piece “lightweight” system coming out. A separate hoody inner and a shell outer. It’ll be after Christmas before I get a hold of any test samples, and I’ll interested to see just how light it is compared to the Yeti-Tex system. And of course I can claim to have invented it. I really must get time to send the original prototype back to get the hood altered. The wicking from the non-pump-liner edge had my neck and front wet again on a very wet day in the Alps a couple of weeks back (don’t ask – mental – couldn’t afford it – couldn’t resist it). But again the rest of me was bone-dry! am I correct that your “rainwear” was your litespeed? I use a lite speed and wonder if the liner approach is the way to go? Being in Denmark I will have to order and buy on line which is a risk that I am prepared to take if it works. Well, half my rainwear was the Litespeed yes. The other half, that really kept me dry, was the Liner Jacket. I’m interested to hear from Geraint as he owns the only other one of these that has been made (as far as I know) and his had the modifications to remove the non-wicking section of the hood…. I’ll give him a nudge! Well the main aim for me was to re-use the windproof that I’ll be carrying anyway during the summer. 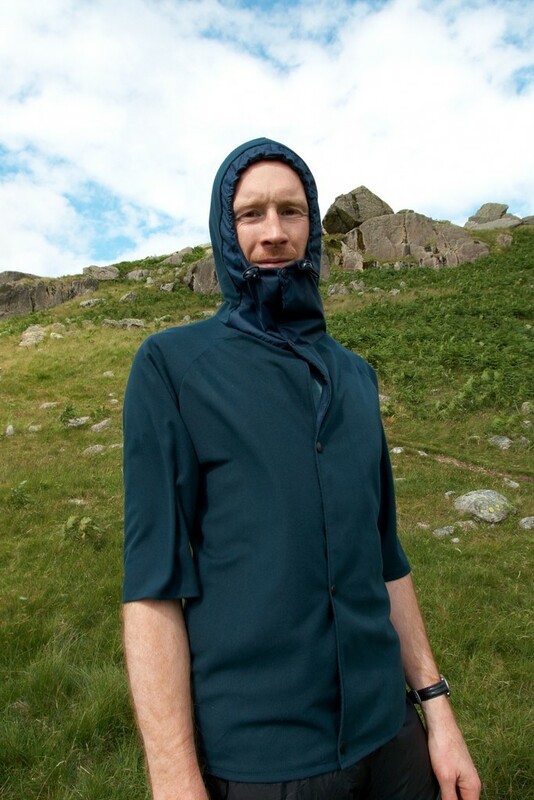 I’ve found a windproof and T-shirt is all I need for a lot of summer conditions. So to be able to re-use that windproof as part of a Paramo-type system that also runs pretty damn cool (cooler than any “full” Paramo garment I think) is the ideal. If you can use the Third Element as a summer windproof that would cover it, but from what I read you’ll have to run very cool to find that comfy. Then again, being in Denmakr that might work for a lot of the conditions? I’m not sure. Your comments reflect my feelings that Paramo is too hot for summer. I will probably use a BPL merino hoody and whilst it may be a little warm it allows me to layer with a lite speed and perhaps a paramo shirt e.g. explorer, though I need to explore these thoughts further. Hmmm… confused there Roger – I can’t see the waterproof layer in that? Just back from the snow in Sweden, sorry about the confusion. Waterproof when needed would be the Integral Designs Sil Cape, about 160 gms and is a better option than a poncho in my view. By the way it was so cold in Skåne that even saw people skating on the lakes. Wow skating in Skåne? It is a cold winter then. LBs folks were out skiing on the lakes last weekend – plenty of snow there now. Geraint dropped me a line to let me know that his Yeti Liner Jacket seems to be working out very well. He’s not had to use it in a sustained rain but so far it seems to be fine. Overall – I reckon I’d be waiting to see exactly what Paramo are offering on this before I asked Neil for another. I think they may want to concentrate on their main line of products. I see the Paramo London store now mentions Men’s Stretch Hoodies as being in stock but there is not much detail in there advertisement. I’m hoping that they’ll have them at the OS Show in Birmingham this weekend. We’re off for a bimble around the Long Mynd area on Saturday. That’s about all you can do there – bimble – the hills are just nice and rounded. 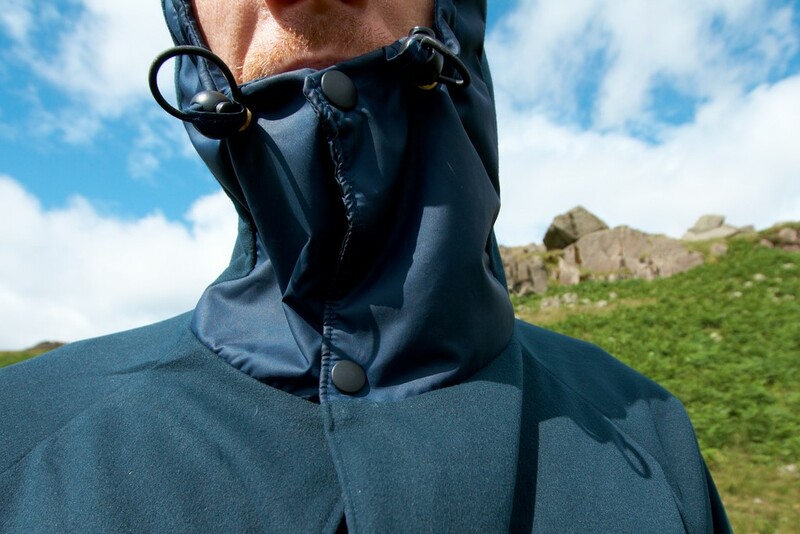 Well I talked to Paramo… and they’re not planning a “Liner Jacket”. Some wires crossed there it seems, sadly. In essence, although they agree the principle, the durability (or lack of it!) would be a problem for a brand that has a reputation for providing a lifetime guarantee. 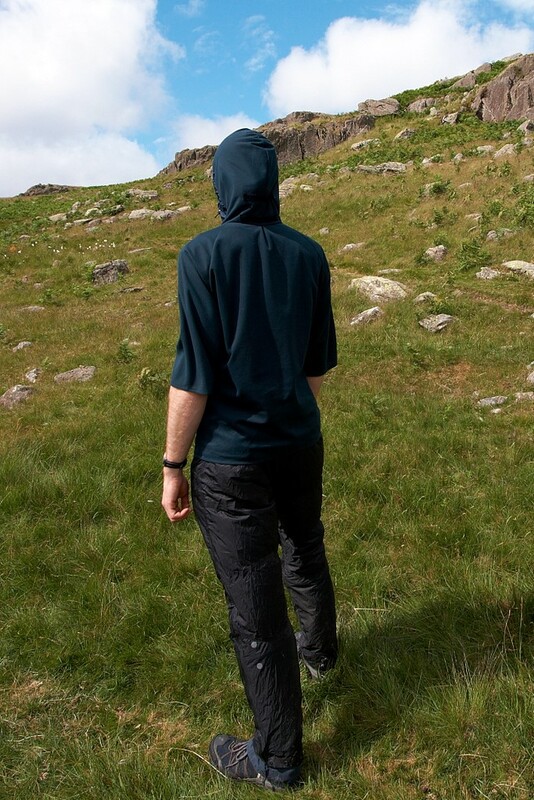 The stretch-hoody isn’t pump liner material – and it’s pretty hefty! The new lightweight face-fabric is very impressive however. A jacket made from that would be something I may well consider for the summer. I think I’d have weakened and bought the smock had they any left in my size at the time! So the world’s maybe not quite ready for the YetiSmock. It will happen though, you just have to wait for the fabric to catch up with the idea. 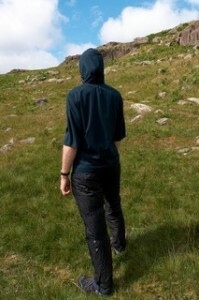 To resurrect this topic… during the summer I have been using a ventile style cotton as my waterproof with mixed results. Now autumn is on us I’m planning to experiment by using the liner jacket underneath the cotton. 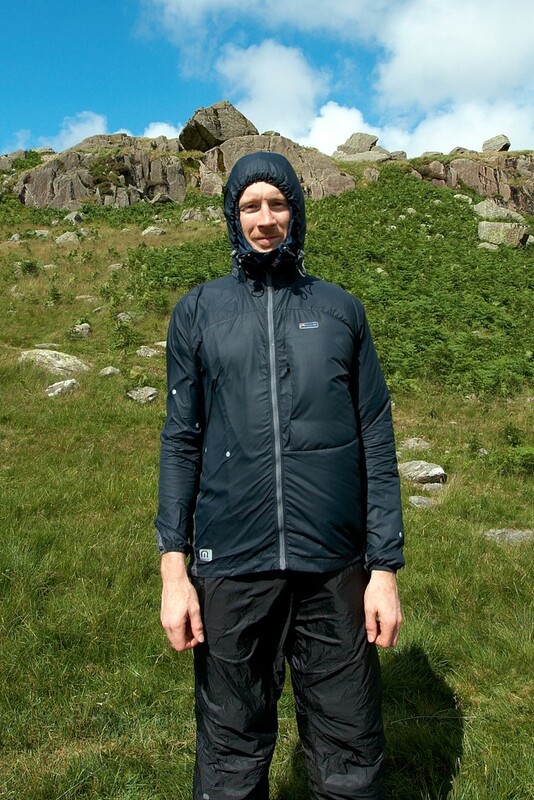 I can’t see any reason why it shouldn’t work as well as under the Montane windjacket. Thoughts?? Nothing obvious springs to mind. In fact Hilltrek are making ventile/anology jackets: http://www.hilltrek.co.uk/acatalog/Cotton_Analogy.html. So perhaps worth asking them for details of how they perform? Sounds like it should work fine Geraint. I’d be interested in what you discover (also qny info fro, Hilltrek – thanks for that Martin!). Finally had chance to give the ventile/liner jacket a proper test. I walked up Snowdon last weekend in pretty foul weather wearing a merino base layer, liner jacket and single ventile smock and the combination coped really well. i thought water was coming in at one point at the shoulders but could find no evidence. the important thing, i think, is that I was comfortable throughout in a range of weather conditions over several hours. My one reservation is how well it performs if the ventile wets out but that will have to be for another day. I also wore a pair of five fingers classics and they performed brilliantly. I’ve had the liner jacket fail at the shoulders whilst we were on the GR5. I am rather disgruntled about it! I’m talking to Cioch to try to figure out what might have happened. One thing they mentioned that amazed me that they’ve never mentioned before – all their jackets have two layers of material at the shoulders. I am not sure if I will be sending the jacket back now since Paramo have brought out the Quito. It has a proper hood – and it should be properly waterpoof! You walked it in Five Fingers? Excellent! We love them. I guess you mean two layers of microfibre at the shoulders? Does that apply to Paramo as well as Cioch I wonder? My solution to protecting shoulders – I bought a £2.95 vinyl poncho and cut out the hood and shoulders so that I can slip it on over whatever “waterproof” I’m wearing when the weather is really bad. It only weighs 60g and it doesn’t matter that its not breathable. Yes – sorry that’s two layers of Pump Liner at the shoulder. I can’t believe they didn’t mention that before! 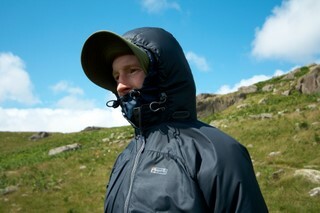 The poncho idea might have been useful on the GR5 when it failed but I think with the sweat that it would build up I’d still be wet! I don’t think I explained it very well.Its no longer a poncho as such. If you can imagine a poncho with everything missing except the small bit that covers the top of the shoulders and the hood. Oh yes – I got it – but I still think I’d get a sweaty head. Sadly I know it wouldn’t have helped with the Liner failure since I fashioned something very similar out of a plastic bag and the condensation under it was astonishing (even for the small part of it across my shoulders). I’ve been following this thread ever since it first came out (googling about windshirt+pump liner combinations). I would still very much like to put together such a system with my Montane LiteSpeed. I just bought the Paramo Velez Adventure Smock Lite and like it a lot, but the front of the smock is way too short. Would you know how I can possibly get my own liner jacket? Would Cioch still make one? I do think Cioch would make another (get them to double up on the shoulders! I still can’t believe the never mentioned that…). Good luck with it – I’m very interested to hear if you go ahead with it! I was wondering if this idea had progressed any further. I’m afraid not Brett. At least, not with me. I did have some long discussions with a manufacturer of this kind of directional clothing about what I’d learned so hopefully the ideas will not be lost to the world! However Paramo themselves have since brought out something rather similar (I can’t recall the name of the system) which I remember hearing good things about. However my focus is now entirely elsewhere. Next PostNext We’re back – and I’m developing images. A lot.